Traditional mooncakes, snowskin, lower-sugar, molten lava… we got it all covered for you. Mooncakes are an indispensable treat during the Mid-Autumn Festival, offered between friends or on family gatherings while celebrating the festival. As years go by, the varieties become more creative and fanciful, going beyond the traditional lotus seed paste for more modern interpretations. For those more health-conscious, you will be glad to know there are several lower sugar options available. Other than what goes inside, the packaging of mooncakes have become a talking point too, as people do keep them as decoration boxes after the festival. Created by Executive Chinese Chef Mike Tan and team, Madame Fan’s signature Pu Er Tea Mooncake can evolve a sense of nostalgia with the subtle fragrance upon every bite. 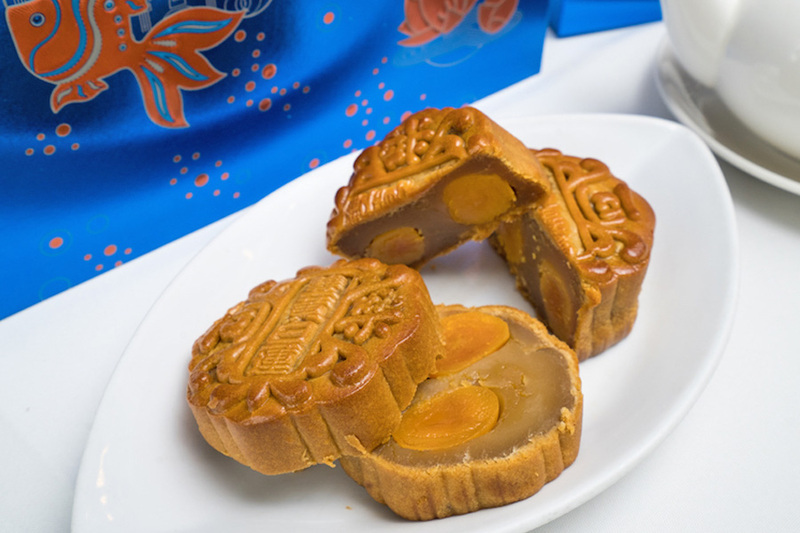 While traditional mooncakes generally are sweet due to the lotus paste, the Pu’er added some bitterness and fragrance to balance out the sweetness, also creating more depth in the flavour profile. 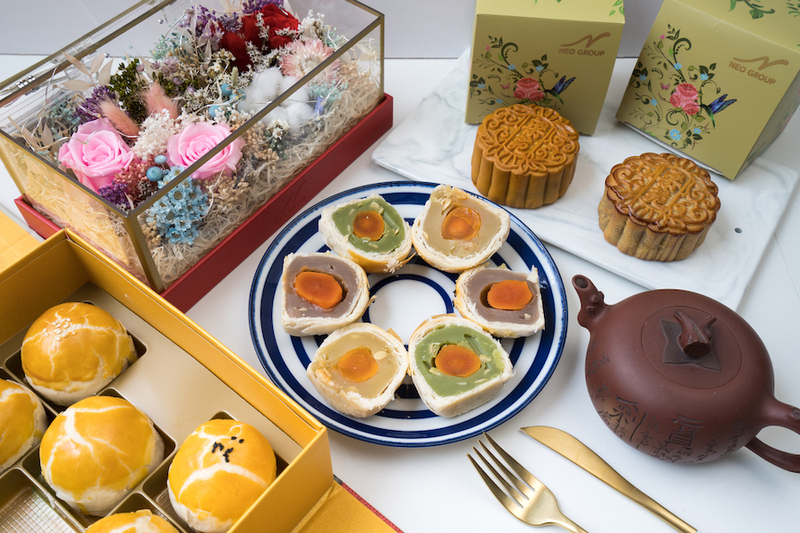 Apart from the traditional baked mooncakes, you can look forward to the snow skin selection such as the Champagne Chocolate ($79.90) made from dark chocolate, Matcha Paste with Melon Seeds ($71.90), Creamy Durian Paste with Durian flesh ($75.90) and Cempedak ($73.90) which are Jackfruit Mooncakes. 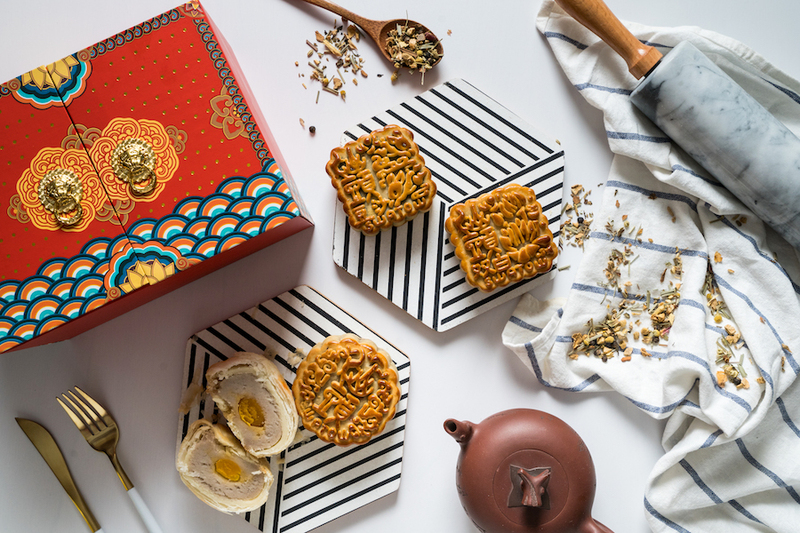 The mooncakes are contained in a specially designed crimson red latticed box that resembles an oriental jewellery box, decorated with a gold crane clasp and lace pattern that props up as a serving stand on its own. Very elegant. Customised gift box branding is also available for loved ones and business associates. JW Marriott Singapore South Beach Festive Counter at Level 1 and Madame Fan, Level 2 of The NCO Club from now to 24 September 2018. From 1st to 24th September, Marriott Rewards, AMEX, DBS and UOB card-holders can enjoy a discount of up to 15% whereas 10% discount applies to all other bank card-holders. 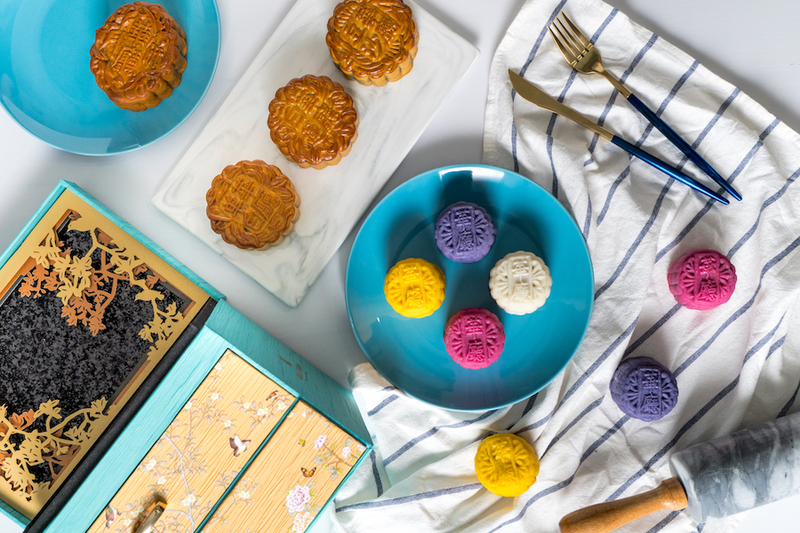 The tradition of eating mooncakes and pairing it with a cup of tea goes a long way back. 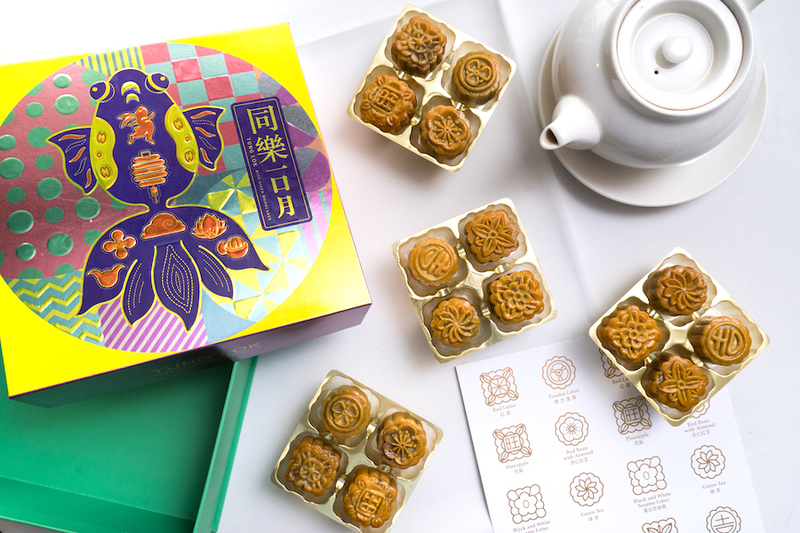 What makes it more convenient is the infusion of premium tea blends into the mooncakes itself. 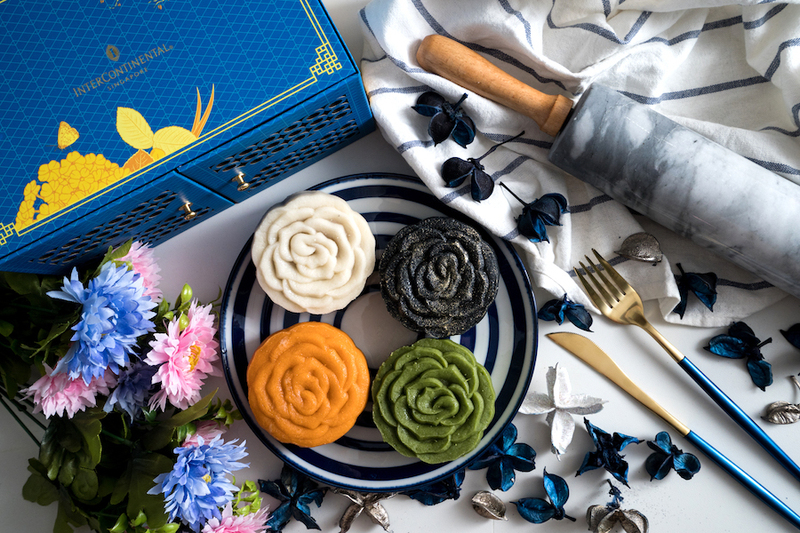 This year, InterContinental Singapore debuts four new tea-infused Snowskin Mooncakes also known as the Tea Collection: Black Sesame with Ambrosial Osmanthus 冰皮黑芝麻莲蓉桂花巧克力, Rich Matcha with White Chocolate Truffle 冰皮绿茶莲蓉白巧克力, White Lotus with Mandarin Peel Chocolate Truffle 冰皮低糖白莲蓉陈皮巧克力 and Earl Grey with Strawberry Chocolate Truffle 冰皮伯爵莲蓉草莓巧克力. Recommended is the Black Sesame with Ambrosial Osmanthus Mooncakes, in which you get floral tones along with smooth and earthy paste. A plus point is that it is not too rich or sweet, so that you won’t feel guilty having more. What steals your heart is how intricately designed they are, with striking colours and shaped like roses. This is especially so when they are contained in an elegant latticed chest, designed with colourful birds and flowers patterns that reflect the hotel’s iconic centerpiece – The Lobby Lounge. These are the first mooncakes in Singapore certified by Health Promotion Board (HPB) for containing lower sugar and higher dietary fibre. 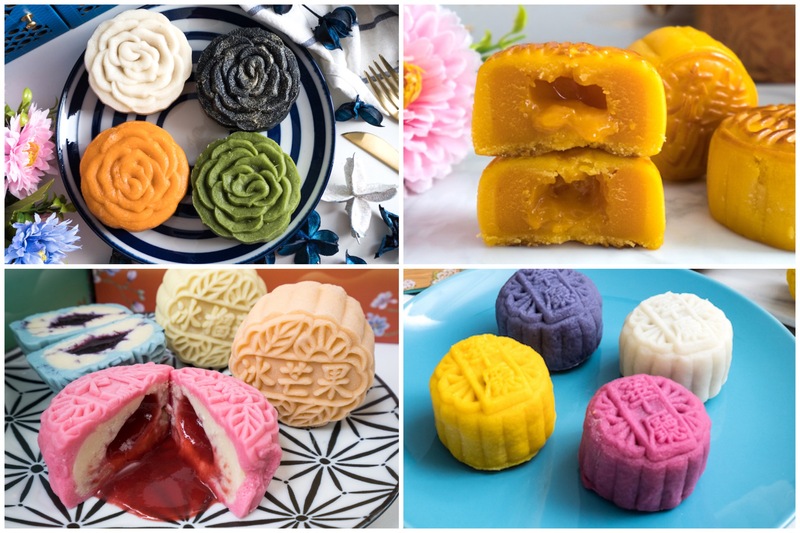 The HPB-approved mooncakes include all the mooncakes containing White Lotus Paste and Red Lotus Paste, great for those who love these festive treats but are watching out for sugar levels. 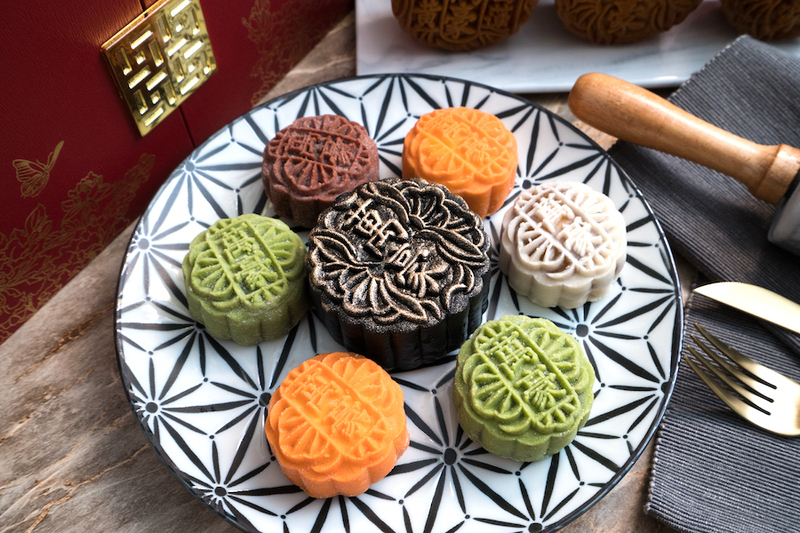 The special highlight is the White Lotus with Nuts Snow Skin mooncake, further infused with superfood Moringa Leaf – known to contain Vitamin A, C, E, calcium, potassium and protein, support brain health, anti-inflammation, antibacterial and protects the liver. Wah. The limited edition TungLok Treasure Box contains multiple bling-bling – with designs of symbolic goldfishes and lotus flowers, further enhanced with LED light (powered by USB connection). 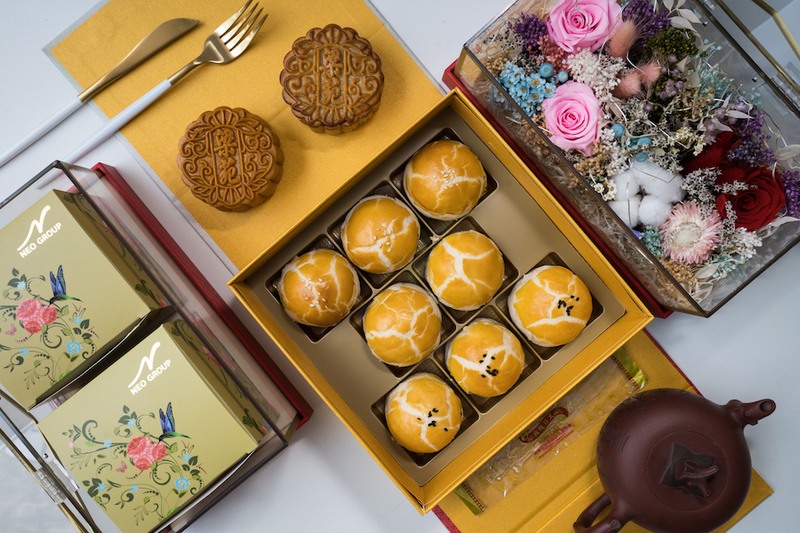 Tropical fruits take the centre stage for the Snowskin Mooncakes Collection this year at Pan Pacific Singapore. 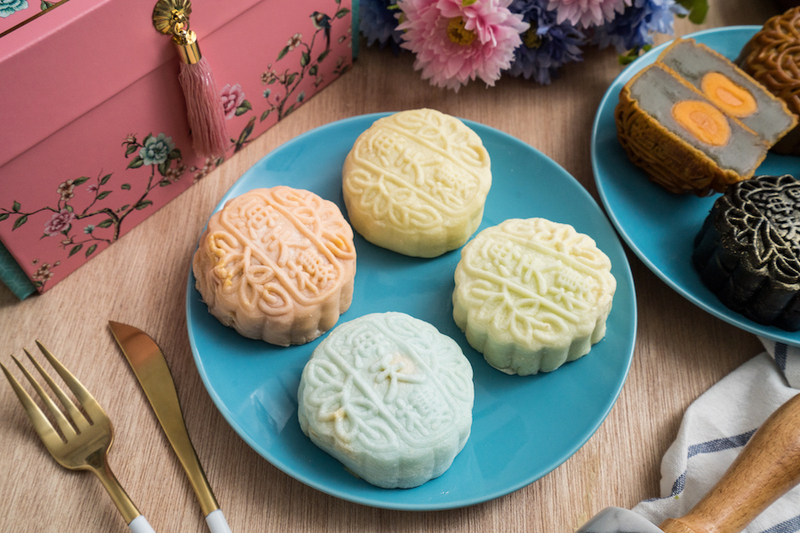 Durian lovers will get to enjoy both Mao Shan Wang Durian and Durian Gula Melaka – available in a beautiful baby blue shade; whereas other striking flavours include Cempedak and Lychee & Soursop. These come in a pretty-in-pink jewelry box that complement the pastel hues of the snowskin mooncakes within. For the baked mooncakes, healthier options such as the Charcoal Melon Seed with Sesame Paste ($69.80 for box of 4), Low Sugar Pandan Paste with Single Yolk ($69.80 for box of 4) and Low Sugar White Lotus Seed Paste with Macadamia ($63.80 for box of 4) are also available. When you have some of the best signature tea blends infused within snow skin mooncakes. Hua Ting’s Mini Fruity Noon Tea has a refreshing green apple filling with a white chocolate core imparted with Hua Ting’s premium tea, giving every piece bright floral notes and hints of orchard fruits. 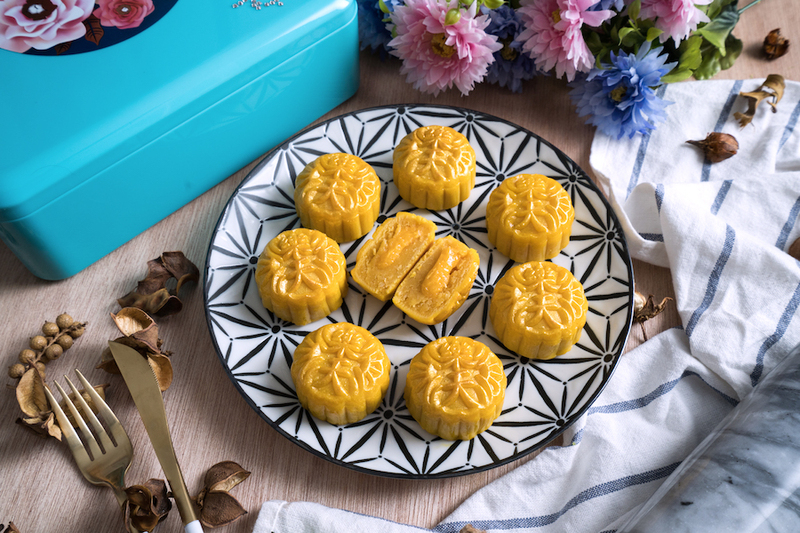 Their all-new Mini Salted Egg Custard has a custard paste, mixed with real salted egg, which provides a smooth custardy texture compared to the ‘traditional’ salted egg mooncakes. 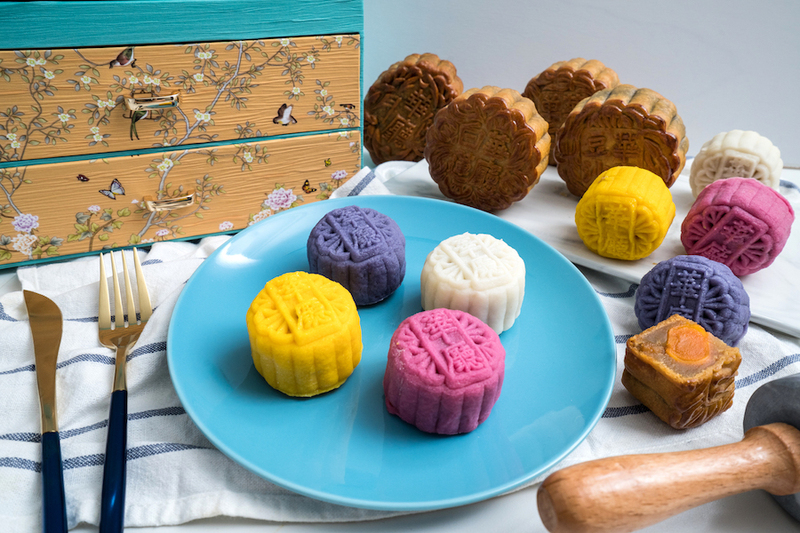 For those craving for some alcoholic mooncakes, alternative options include Blueberry with Vintage Hua Diao Wine using 30-year 陈年花雕 (Vintage Rice Wine) and White Lotus Paste with Champagne Ganache. 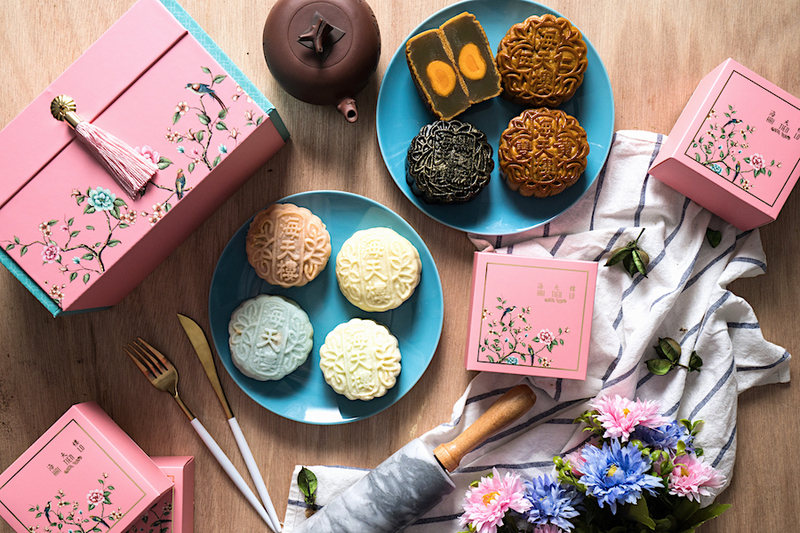 The mooncake boxes are decked in a beautiful turquoise hue (love it) with chinoiserie motifs evoking a sense of tradition, available in Deluxe or Premium designs. 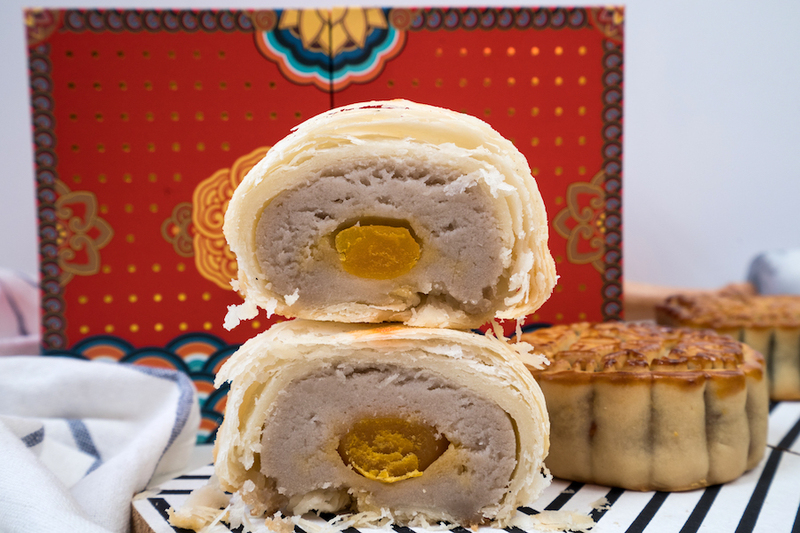 Check out this shiny gold-dusted White Lotus Seed Paste Baked Mooncakes, filled with a mixture of Chrysanthemum, Mixed Grains, Serrano Ham & Salted Egg Yolk. Wan Hao Chinese Restaurant at Singapore Marriott Tang Plaza Hotel has launched this Limited-edition Royal Gift Set ($238 for a box of 4) that contains four premium mooncakes, a bottle of premium Villa Girardi Amarone Della Valpolicella 2013 (375ml), a wine opener and a wine stopper. 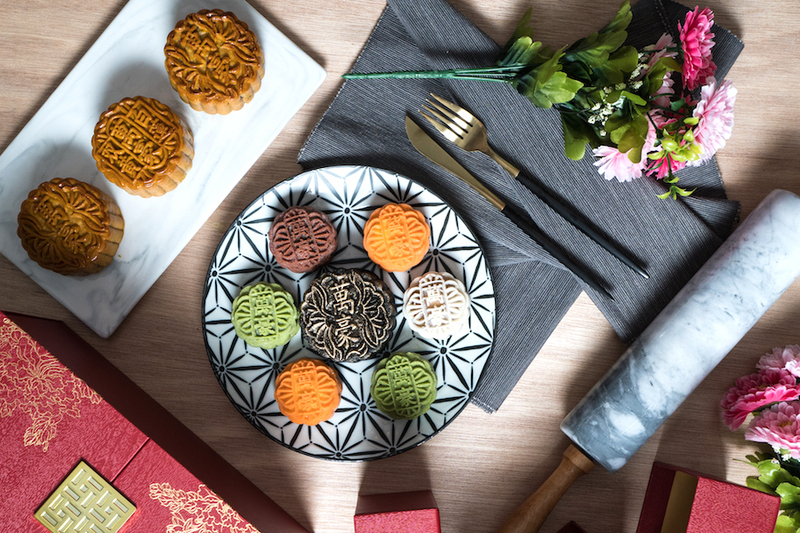 What you get is a charcoal crusted baked mooncake, with hints of delicate chrysanthemum in the smooth, white lotus seed paste, juxtaposed with savoury flavours. The mooncakes are contained in a two-tier oriental treasure chest inspired box, hot-stamped with chinoiserie of flowers and butterflies. You can also indulge in wine pairing with a bottle of premium Villa Girardi Amarone Della Valpolicella 2013 (375ml) to complete the treat. Other new unique flavours available from 20 August to 24 September include Cempedak Paste Baked Mooncakes with Pumpkin Seeds ($78 for box of 4), Chicken Bak-Kwa Baked Mooncakes with Assorted Nuts ($70 for box of 4), Mango Yoghurt Snowskin Mooncakes with Lime Margarita Truffle ($68 for box of 8), Mocha Snowskin Mooncakes with Milk Chocolate Royaltine ($68 for box of 8), White Lotus Seed Paste Snowskin Mooncakes with Salted Egg Truffle ($68 for box of 8). 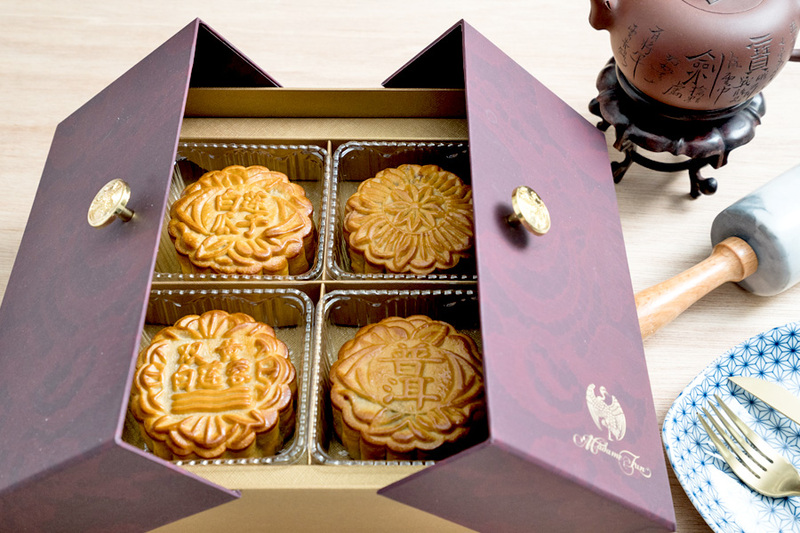 Personalisation of the mooncake boxes with complimentary hotstamping of the company logo is also available with a minimum order of 50 boxes of mooncakes (T&C apply). Known for its Teochew cuisine and Dim Sum, Swatow Restaurant comes to mind whenever Traditional Teochew Mooncake is mentioned. 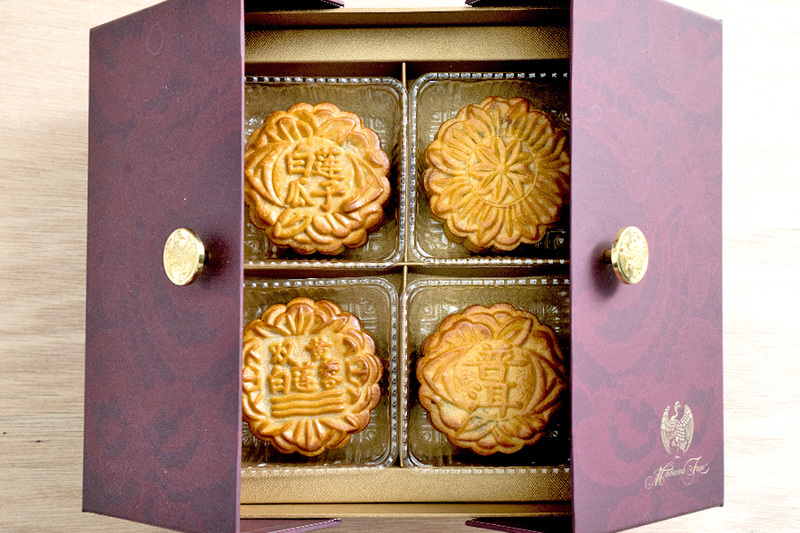 Each mooncake is freshly kneaded and baked upon order, low in sugar and no preservatives being added. Yam is a key ingredient in Teochew cuisine, whereby the Orh Nee is molded within a crisp layer of thin like biscuits, which gives out a mixture of sweetness and crunchiness. Catering to the older generation, suitable choices would be the Traditional Teochew Baked Mixed Nuts ($66); and the Traditional Teochew Baked Walnut Pastry which is a mixture of healthy grain nuts and buttery tart crust. 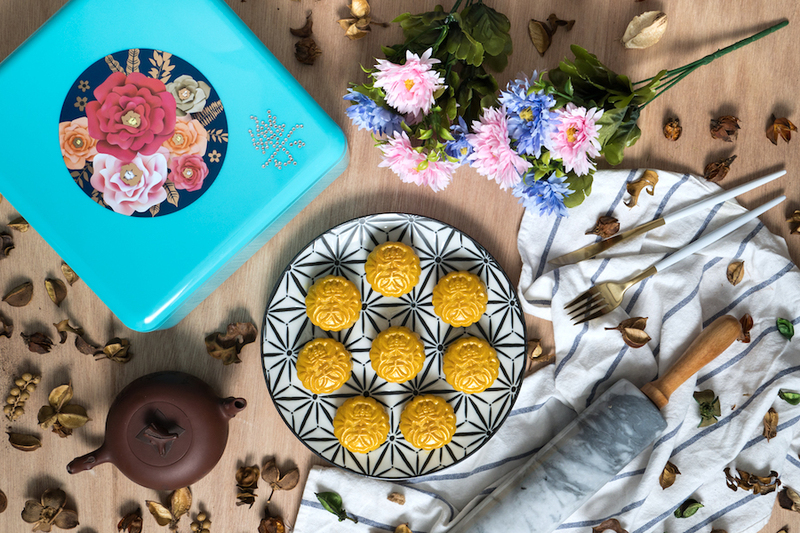 Positioned as Singapore’s Number One Events Caterer, Neo Garden is introducing a unique product – the brand-new Royal Trio Yolk Pastry Mooncakes. The delicate 16-layered dough is handmade in-house and comes in 3 different low-sugar fillings of Yam, White Lotus and Pandan. Unlike their baked and snow skin counterparts, the delicate yolk pastry offers a different kind of sensation that is melt-in-the-mouth, each encasing a single salted egg yolk. 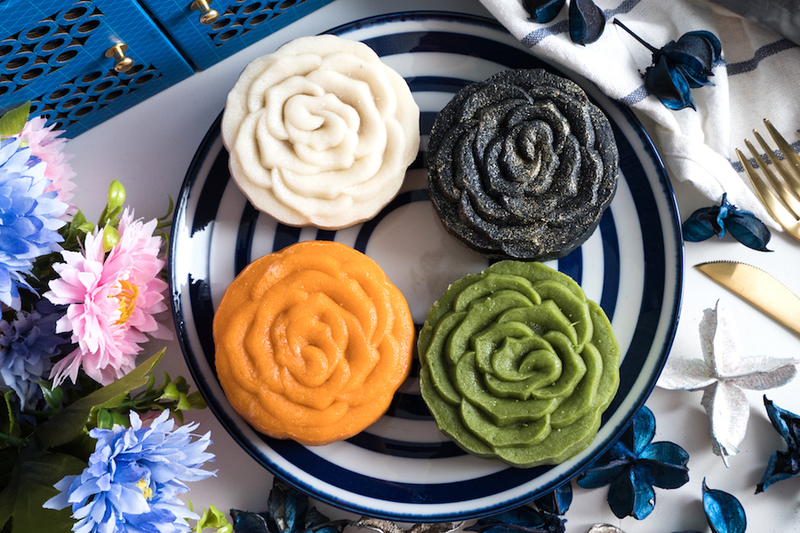 If you are up for some refreshing Snow Skin Mooncakes, flavours offered include the all-new Osmanthus for that floral fragrance, ($62 for 4), the aromatic and earthy Green Tea ($62 for 4), the juicy and not-too-sweet Mango ($62 for 4), the ever-popular and creamy Mao Shan Wang Snow Skin Mooncake ($88 for 4), and the kids’ favourite of Blueberry Snow Skin Mooncake ($62 for 4). As for the packaging for the baked mooncakes, expect a mini “glasshouse” made entirely out of clear acrylic instead of the usual cardboards, fabrics and metals. The outline is tinted with gold to add a certain poise and elegance to it. Turn it into a chic terrarium, a jewellery box, or even a classy tissue box holder! Trending lava food items such as lava cakes and lava croissants, are now presented in the form of Lava Mooncakes. Exclusively launched this year by the Paradise Group, the Mini Baked Custard come with Molten Salted Egg Yolk centre; brushed with real, edible gold dust with a touch of sophistication. In addition, there are many innovative flavours this year, which include the Exquisite Mini Snow Skin Collection (S$56 per box of 8): Orange Citrus with Lychee Martini Truffle, Coffee Macchiato with Black Sesame Truffle, Jasmine with Hazelnut Crunch Truffle and Japanese Chestnut with Osmanthus Truffle. The mooncakes are packed into these unique Japanese bento-like boxes that are made with recyclable materials. There is also a bling-bling effect with crystals embedded. Also good to know that each box of mooncake will come with a complimentary tin of Paradise Group’s special blend of glutinous rice tea for mooncake pairing. 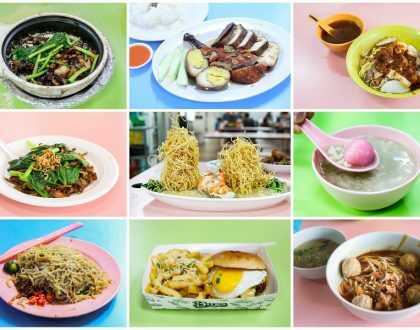 Early Bird Offers (13 – 26 Aug): Citibank Credit/ Debit Cardmembers and PGR members can enjoy 20% off and the latter can enjoy additional 5% discount on their 2nd to 20th box in a single receipt. Normal Offers (27 Aug – 23 Sep): Citibank Credit/ Debit Cardmembers and PGR members can enjoy 15% off and the latter can enjoy additional 5% discount on their 2nd to 20th box in a single receipt. 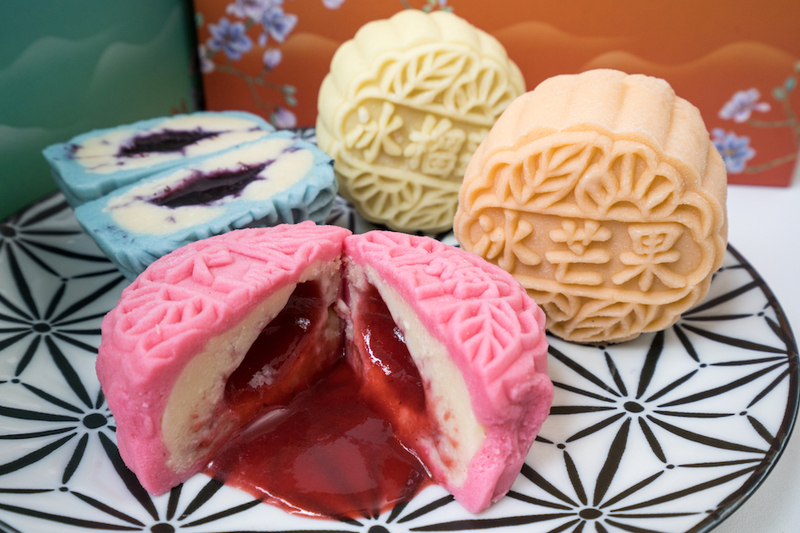 The surprise comes when you cut through these Snowskin Lava Mooncakes, and the inside will ooze with fruity flavours. Coming in attractive colours from purple to yellow, the best sellers are the Cream Cheese Snow Skin with Strawberry Lava, Blueberry Lava and Mango Lava (all $66 for 4 pieces) – which would be a favourite with kids as well. Other intriguing flavours include the Blueberry Purple Sweet Potato ($66 for 4 pieces), Mushanking Durian ($72 for 4 pieces) and Pure Custard ($66 for 4 pieces). 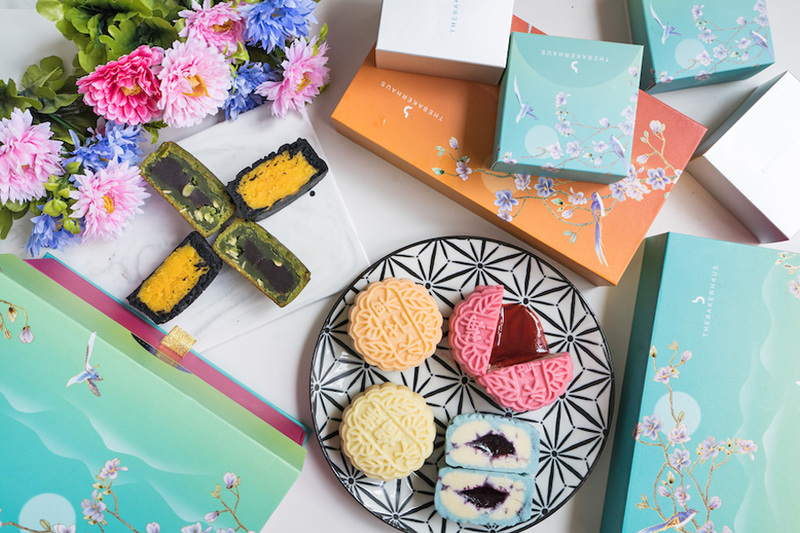 If you prefer the baked skin mooncakes, the Sambal White Lotus ($68 for 4 pieces) and Japanese Matcha ($68 for 4 pieces) are the not-so-ordinary ones. 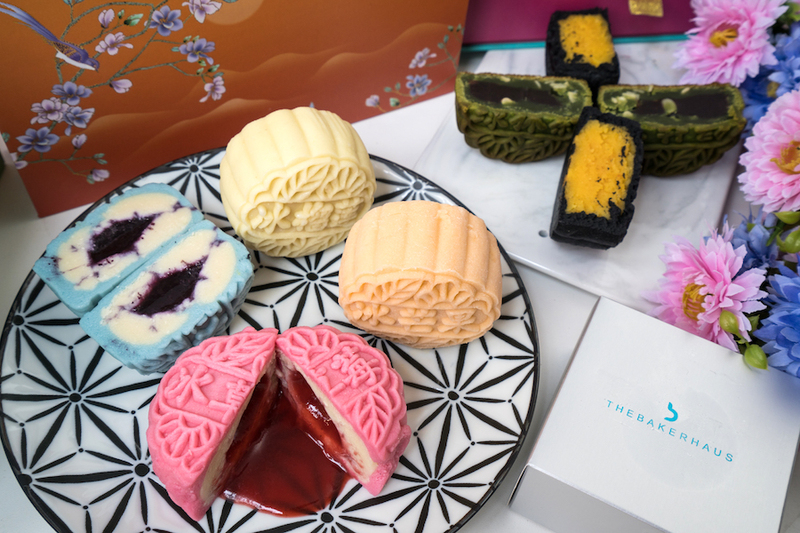 Interesting to know that TheBakerHaus also offers customization, where corporate clients can have their logos appearing on the traditional mooncakes – making them the perfect corporate gifts. 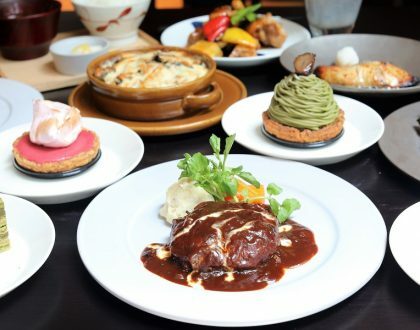 *DanielFoodDiary.com readers enjoy a 10% OFF retail rates from TheBakerHaus mooncakes. Just show this blogpost at the booth to enjoy the discount. 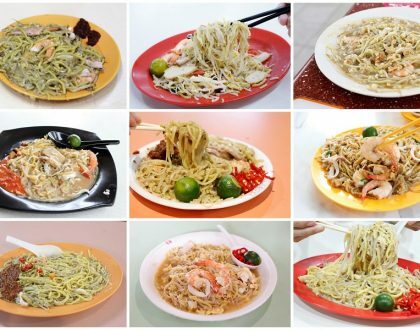 * Compiled by Nicholas Tan @stormscape. This entry is brought to you in partnership with Hua Ting, InterContinental Singapore, JW Marriott, Neo Garden, Pan Pacific Singapore, Paradise Group, Singapore Marriott Tang Plaza Hotel, Swatow Restaurant, TheBakerHaus, and TungLok Group.